I’ve had mixed results exposing others to Amy Winehouse. She never really caught on with Mike E and Mark Duncan , but Larry bought the Back to Black CD and we spent the majority of our Montana trip listening to her. On the Larry front, an Amy Winehouse phrase is in our every day language. It’s part of our corporate culture, proving to be just a tad more resilient than Pep-see Ya. What kind of fuckery is this?!? Vicky: I think we are going to need to go ahead and purchase the reporting component. Larry: What kind of fuckery is this?!?! Larry: The meeting is going to be at 8:30 AM [Author’s note: I don’t like waking up early when a lunar eclipse or a hike or Chuck E. Cheese is not involved]. Vicky: What kind of fuckery is this? My brother easily adopted to me and Larry’s catch phrase. On the way to Assateague, Jay and I got stuck in Beltway traffic and I received a phone call. Vicky (answering): Hello? Oh, Hi Larry! “I caught myself saying, ‘I’m going to rue the day when Amy gets it together,’ ” says Ahmir “?uestlove” Thompson, whose hip-hop band, the Roots, has performed with Winehouse in Europe. “Once I heard [her music], part of me felt like: ‘Don’t rock the boat. Let this take its course ’cause that way you’ll get great music.’ And part of me wanted to reach out to her. This struck home to me. There are those whose drinking I look down upon, those who I do not hesitate to judge harshly. And then are those who have established problems that I overlook and don’t even give a second thought to. Why the discrepancy? Why is it not an even playing field in the arena of who Vicky condemns? 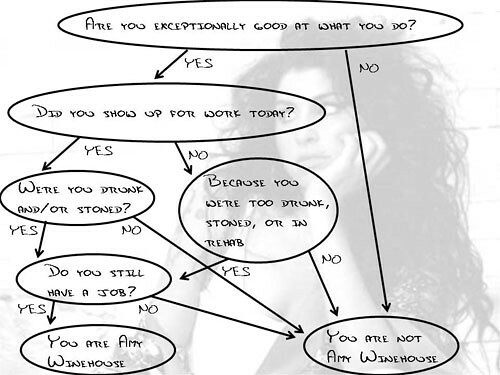 I think it is a bit of the Amy Winehouse Syndrome. Here’s the key– If you can tell great stories and make me laugh in the wee hours of the night, suddenly your drinking is no longer a factor. I let it take its course cause that way, I get to hear great stories. It’s easy to overlook alcoholism when there is such great art. What kind of fuckery is *that*? In Amy Winehouse’s case, I’m not quite sure, “great art” is always the most accurate phrase. On the contrary, her live performances have some displays that are decidedly ungreat. This one gets pretty horrid after about two minutes. I like how the background singers forge ahead. Perhaps that is why her relatives can now surface with plans to help. Though I’m not sure boycott is the going to be the most effective route. This was dinner Wednesday night. Very good. I’m a sucker for olives. On Monday, Ann and I had our very first belly dancing class courtesy of the YMCA Open University. I expected to go through a period of humilation and awkwardness to get to the fun, but the atmosphere was instantly relaxing and free. I had a very good time and look forward to the coming weeks. There were some less than stellar moments, however. They had everything to do with my communications skills and very little to do with my ability to isolate motion in different body parts. Since it was the first class, the instructor had us go around the room to introduce ourselves and tell the class why we were there. The very first girl went and she spoke for some time on all the advantages she expected to see from belly dancing– exposure to other cultures, boosted self-esteem, exercise, all very good reasons. As I listened to her well-articulated answers, I thought about my eventual answer in my head. And suddenly I felt the urge to laugh. I have Sawyer blood in me and inopportune laughter is one of our “features”. My siblings and I demonstrated we inherited this trait early on, laughing at the word “naked” in church. At my cousin Adam’s wedding in 2000, nearly our whole pew struggled to stiffle laughter during part of the ceremony (it was the antics of my father that were so hilarious– not the actual ceremony). At least nine of us, representing two seperate branches of the family and two seperate generations, burst out laughing waiting at a funeral once. So as soon as my own thoughts struck me as amusing, I could feel the urge to laugh. My belly dancing classmate was still elaborating on her variety of reasons for being there. I hung my head and cracked a smile. Thank goodness I still have all that Locks of Love hair to obscure my face. Just when I thought I had fought back the urge to laugh, it came back with a vengence. I tried, I really tried, but I couldn’t hold it in. Now, this wasn’t a very large class and I was very audible to everyone present. Worse– it looked like I was laughing at this poor girl. The others seemed satisfied with my explanation and the teacher gave an understanding smile. “Any answer is good,” the teacher told the class and then looked at me, “So it’s okay if you want to say, ‘I like the glittery costumes'”. One thing about my timing is good. I’m glad I laughed during the first girl’s spiel. The second girl was supposed to be in one of the rooms in Norris Hall on April 16th, but didn’t make it to class that day. She said that event made her take an inventory of her life and she realized how much stuff she wanted to do in life that she had never tried. Can you imagine if I laughed during that?!?! Anyway, we go around the room and everyone has all these great answers as to why they were there. Then the teacher calls on Ann. “Uh……….” Ann got a glazed, deer-in-the-headlights look on her face. Regardless of the initial reason, the class is super fun and not bad exercise at all. I checked in on my pulse at one point and it was elevated (far from “Angel Rest ascent” elevated, but an improvement over “sitting at a computer”). And I could definitely feel somes muscles in action that normally remain idle. I expect very, very good things to come. In the last week, I’ve had horrible luck when it comes to getting up early. It seems everytime I’ve set my cellphone alarm early, something spites my efforts. Last Wednesday morning, some overnight upgrades were occuring on one of our servers that hosts three key web applications. On paper, everything indicated the updates would be fine, but I took extra initiative to get up at 4:30 AM to perform testing on all three sites. I diligently confirmed third party components, email relaying and file permissions were all in order before heading back to bed. The next morning, I emailed to the server contact to report all was well on our end and I congratulated him for a smooth update. Turns out they had some unrelated events surface and had to reschedule the updates. D’oh. This morning there was a lunar eclipse! Figuring the workings of the universe are slightly more reliable than server maintenance, I set my alarm. Christopher Columbus once exploited the predictability of a lunar eclipse to weasle food from Jamaican natives. Even ancient civilizations found reliability in celestial events. Pretty safe bet for Vicky then, eh? My alarm went off, I stumbled onto my deck and I could just barely see something that resembled an obscured, pink moon. It just wasn’t the earth’s shadow that hindered my view. The sky, particularly near the horizons, was overcast. I went downstairs, sent a few select IMs to Mike E (who was also up for the same purpose) and took the dogs out for a walk. By that time, the entire moon was gone. If I were to curse something, it would have to be the morning mountain fog that I usually cherish. The dogs and I still had a good walk and since we are both up and lacking a lunar eclipse, I get to meet Mike for coffee at the Easy Chair. This day will still manage to start on a good note afterall. For the coming week, though, I think I’m going to focus on a little more wise, and a little less worms. Web Cam from Burruss. You can see the new memorial and the drillfield from here. Canoe-ers & Kayakers: Picking up trash along riverbanks and mid-river islands. Walkers: Picking up trash at boat ramps, along river-access roads and riverbanks. Transport dive team. Help divers by transporting large debris. Assist canoe/kayakers by picking up trash-filled bags. Others: Help load/unload boats, supplies, and equipment at all drop-off and pick-up points. Help unload trash from boats at pick-up points. Additional information can be found on the Renew the New website.